New federal legislation that took effect in January 2012 doesn’t ban traditional incandescent light bulbs invented by Thomas Edison more than 100 years ago. Over the next several years all newly manufactured light bulbs will have to consume no more than 75% of today’s lamps and still produce the same amount of light. That effectively rules out traditional light bulbs. The rules currently apply only to 100W (watt) light bulbs. In January 2013 75W light bulbs will follow and as of 2014 60W and 40W light bulbs have to comply as well. Everything takes effect one year earlier in California. As of now the enforcement has been postponed until October 2012.There are many replacements for traditional light bulbs available today. Low wattage compact fluorescent light bulbs (CFLs) and Light Emitting Diode (LED) lamps produce warm light similar to traditional light bulbs using only fraction of the energy of Edison’s light bulb. If you have a lot of recessed lights at home it’s time for a stylish update that will give you better lighting and save you money at the same time. 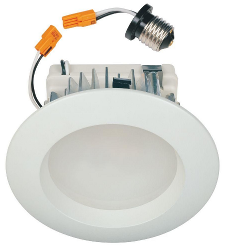 Many companies manufacture retrofit kits for recessed lights that last up to 50,000 hours, eliminating bulb maintenance for up to 20 years. Let us help you save money. Both residential and commercial customers can drastically reduce the energy use by retrofitting old inefficient light fixtures. Call us at 312-404-6948 to schedule a free consultation.